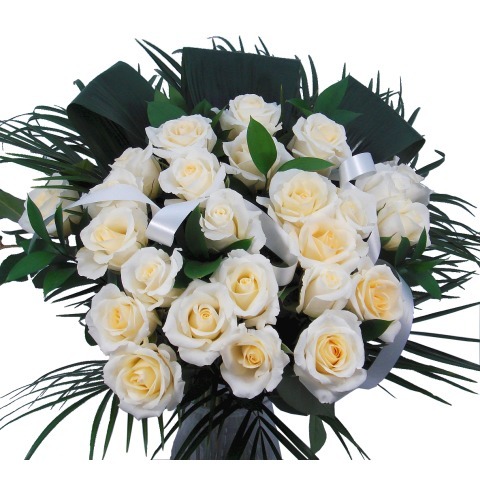 This magnificent gift bouquet of 25 White Roses & Silver Foliage is a idea way to celebrate a 25th Wedding Anniversary. From our Deluxe range it comprises of 25 long-stemmed white Roses and is complemented by silver foliage and presented in decorative wrap. 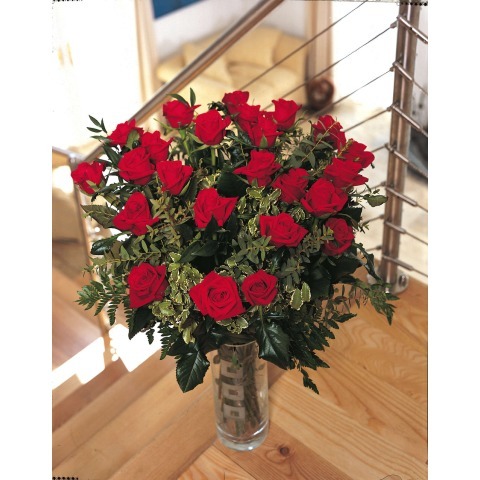 This magnificent gift bouquet of 40 Ruby Red Roses is a idea way to celebrate a 40th Wedding Anniversary. From our Prestige Collection it comprises of 40 long-stemmed ruby red roses and is complemented by seasonal foliage surrounded by striking aspidistra leaves and presented in attractive decorative wrap. 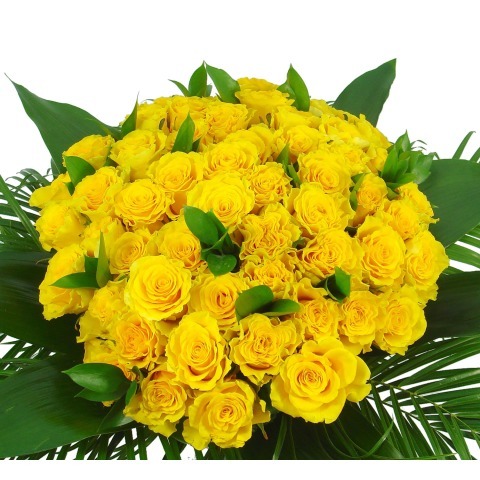 This magnificent gift bouquet of 50 Golden Yellow Roses is a idea way to celebrate a 50th Wedding Anniversary. From our Prestige Collection it comprises of 50 long-stemmed golden yellow roses and is complemented by seasonal foliage surrounded by striking aspidistra leaves and presented in attractive decorative wrap. Celebrate a new arrival with this delightful floral gift bag. Tailored for a Baby Boy, this gift includes a bouquet tied by hand and presented with decorative wrap in a gift bag, a cuddly teddy bear and a 9 inch balloon. Celebrate a new arrival with this delightful floral gift bag. Tailored for a Baby Girl, this gift includes a bouquet tied by hand and presented with decorative wrap in a gift bag, a cuddly teddy bear and a 9 inch balloon. 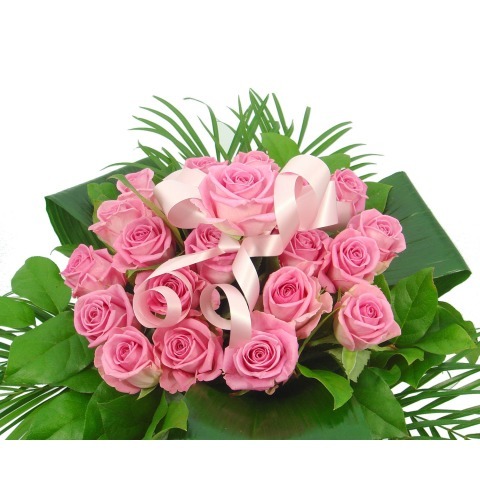 A beautiful 21st birthday bouquet comprising of 21 Pink Rose and Foliage in a hand-tied bouquet. This stunning bouquet from our Deluxe range is presented in attractive decorative wrap and is a great way to celebrate a 21st Birthday! 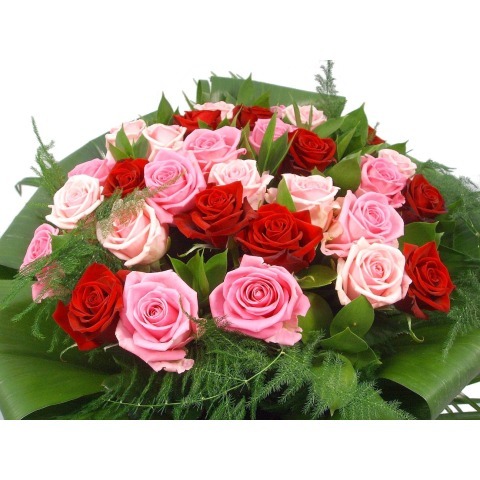 A beautiful 30th birthday bouquet comprising of 30 assorted Rose and Foliage in a hand-tied bouquet. This stunning bouquet from our Deluxe range is presented in attractive decorative wrap and is a great way to celebrate a 30th Birthday! A beautiful 40th birthday bouquet comprising of 40 Ruby Red Rose and Foliage in a hand-tied bouquet. This stunning bouquet from our Deluxe range is presented in attractive decorative wrap and is a great way to celebrate a 40th Birthday! Large headed Pink roses and elegant oriental lilies combine with fragrant foliage to create a stunning hand-tied bouquet. A beautiful hand-tied bouquet of 30 stems of Gerbera daisies. A delightful bouquet of ten fragrant pink oriental lilies, which are presented in attractive wrap. Send it for a birthday, anniversary, get well or simply just because you care. A beautifully wrapped bouquet of white Oriental lilies. Each of the 10 stems has between 3 and 5 blooms create a bouquet that is not only stunning to look at, but also has an exquisite fragrance. An abundant hand-tied bouquet of apricot, cream and green tones. Arranged with cream roses, orange gerbera, apricot lilies, scented white stocks, lisianthus and green Anastacia blooms. Finished with striking lime foliage. A spectacular mass of 50 large headed deluxe red roses with a foliage surround. Hand-tied and presented with a fabric wrap and bow. An elegant hand-tied bouquet in delicate shades of pink comprised of large headed roses and a selection of seasonal blooms. All finished with luxurious foliage and exquisite wrap. The Quartet Bouquet, appropriately named, comprises of a quartet of stylish and striking flowers in shades of pink, cream and lime green. This is a bouquet that will make an impression. Nothing is more magnificent than long-stemmed, elegant roses and these are simply the best of the best. A brilliant and colourful bouquet of all our Deluxe roses blend to present a radiant multi-coloured assortment. One Dozen Sensational, fresh-cut, long-stemmed Red Roses. A Dozen Deluxe White Rose Bouquet. 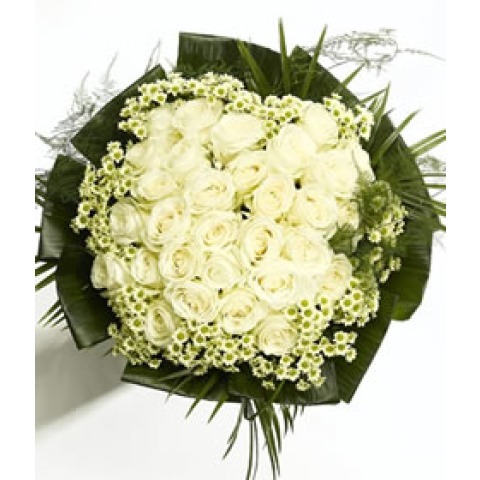 Not only are these white roses simply stunning, but they are also the freshest white roses that your loved one will ever have received. Tied by hand with sprigs of eucalyptus and fern, at our incredibly low Post-a-Rose price. Nothing is more magnificent than long-stemmed, elegant roses and these are simply the best of the best. 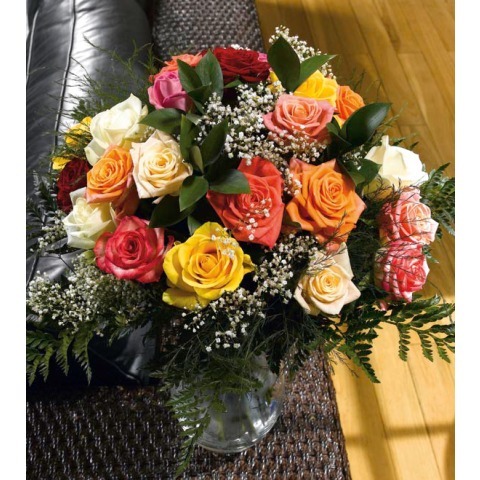 A brilliant and colourful bouquet of 24 Deluxe roses blend to present a radiant multi-coloured assortment. 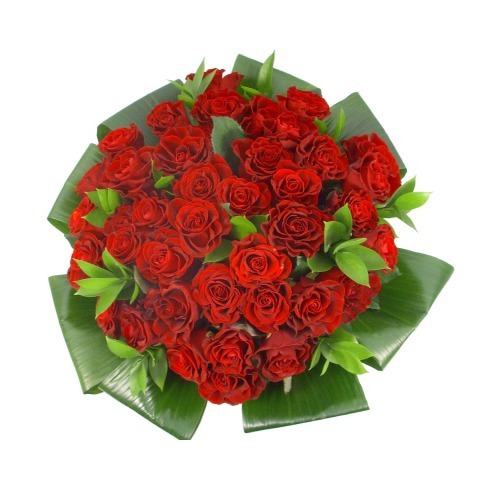 Two Dozen Sensational, fresh-cut, long-stemmed Red Roses. A gorgeous bouquet of sunflowers and complimenting seasonal blooms that include roses, lilies, gerbera daisies in cheerful autumn colours. Accented by fresh foliage this arrangement will provide a ray of sunshine for the lucky recipient. A sophisticated bouquet that is hand-tied in shades of cream. With large headed roses, oriental lilies, lisianthis and santini chrysanthemums, this is a lavish and wonderful gift to receive, no matter what the occasion. Finished with seasonal foliage to create a simply stunning bouquet to send to someone special. Deluxe Sunflower bouquet hand-tied with 12 sunflowers and complimenting solidago, as well as seasonal foliage. It is finished with decorate wrap and fabic ribbon. A bright and cheerful hand-tied bouquet, combines the very freshest and best flowers of the season. This Vibrant bouquet is perfect for any occasion. A Phalaenopsis Orchid presented stylish zinc pot. 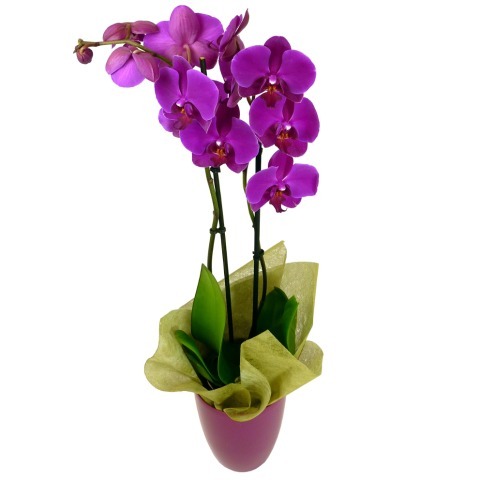 This double-stemmed Phalaenopsis Orchid is a great gift for expressing sentiments of joy. Easy to maintain indoors, this phalaenopsis can bloom 2 or 3 times on the same stem. Colour may vary according to supply. 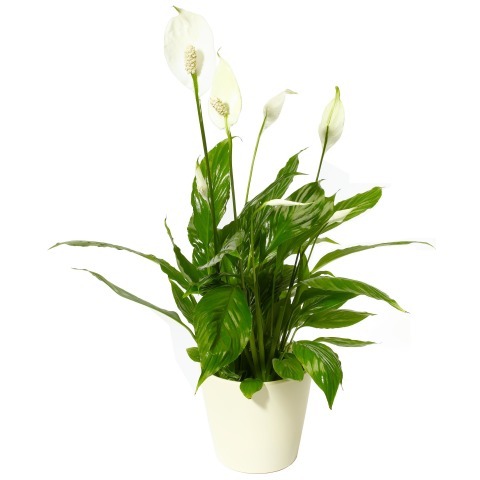 A magnificent Peace Lily with pure white flowers and lush green foliage. Presented in a cream ceramic pot - it makes an ideal gift. This simply breath-taking arrangement consists a stunning mass of large headed white Avalanche roses that are accented by elegant cream spray chrysants and then surrounded by exuberant asparagus plumose, aspidistra, and robellini palms. The hand-tied bouquet is then exquisitely presented in a stylish woven wrap. 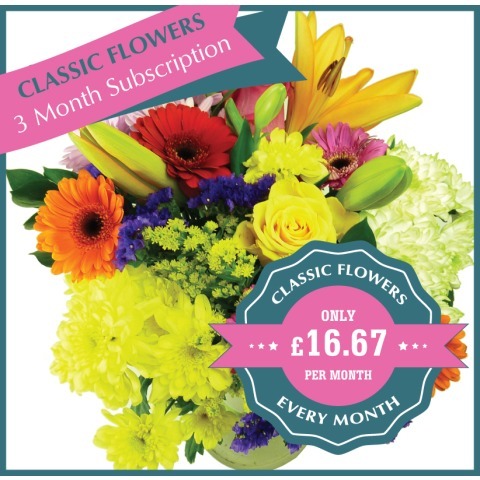 With just one simple and easy order, you can send one of our classic bouquets each month for the next 3 months. This long lasting gift has a saving of over 30% on our normal prices. When a loved one deserves more than the best, this is the gift for you! 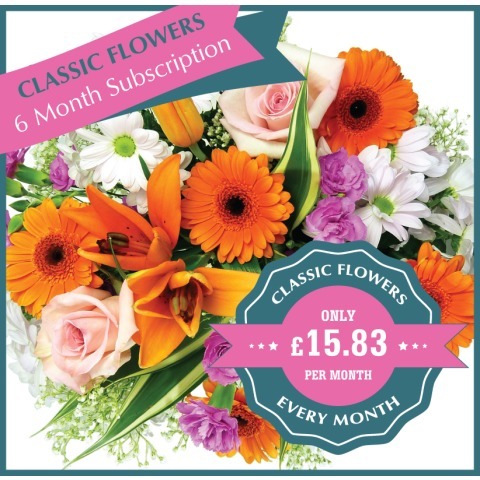 With just one simple and easy order, you can send one of our classic bouquets each month for the next 6 months. This long lasting gift has a saving of over 30% on our normal prices. When a loved one deserves more than the best, this is the gift for you! A beautiful selection of 12 long-lasting Carnations in pink colours. Our Carnations are guaranteed for 14 days and we send our Carnations in bud to ensure your receive maximum vase life. A beautiful selection of 12 long-lasting Carnations in yellow colours. Our Carnations are guaranteed for 14 days and we send our Carnations in bud to ensure your receive maximum vase life. This long-lasting and excellent value bouquet includes 18 stems of assorted discovery and fancy carnation blooms with complimenting gypsophila. The carnations are an assortment of cerise, lemon, pink and white colours. A beautiful selection of 18 long-lasting Carnations in pink colours. Our Carnations are guaranteed for 14 days and we send our Carnations in bud to ensure your receive maximum vase life. A beautiful selection of 18 long-lasting Carnations in yellow colours. Our Carnations are guaranteed for 14 days and we send our Carnations in bud to ensure your receive maximum vase life. This long-lasting and excellent value bouquet includes 24 stems of assorted discovery and fancy carnation blooms with complimenting gypsophila. The carnations are an assortment of cerise, lemon, pink and white colours. A beautiful selection of 24 long-lasting Carnations in pink colours. Our Carnations are guaranteed for 14 days and we send our Carnations in bud to ensure your receive maximum vase life. A beautiful selection of 24 long-lasting Carnations in yellow colours. Our Carnations are guaranteed for 14 days and we send our Carnations in bud to ensure your receive maximum vase life. A scented bouquet of 15 fresh freesias in assorted colours will fill your recipients room with a sweet and fragrant aroma. A scented bouquet of 30 fresh freesias in assorted colours will fill your recipients room with a sweet and fragrant aroma. A beautiful bouquet of 20 stems of Gerbera daisies. A delightful bouquet of five fragrant pink oriental lilies, which are presented in attractive wrap. Send it for a birthday, anniversary, get well or simply just because you care. A beautifully wrapped bouquet of white Oriental lilies. Each of the 5 stems has between 3 and 5 blooms create a bouquet that is not only stunning to look at, but also has an exquisite fragrance. A delightful bouquet of seven fragrant pink oriental lilies, which are presented in attractive wrap. Send it for a birthday, anniversary, get well or simply just because you care.